Peter Thiel is the billionaire entrepreneur and hedge fund manager who became Facebook's first investor in 2004. 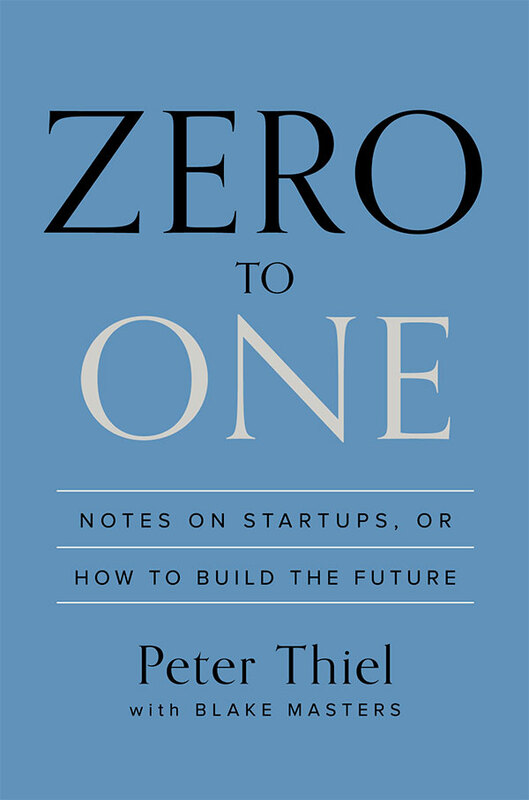 In September of 2014, he published his first book, titled Zero to One: Notes on Startups, or How to Build the Future. Although Thiel is more famous for being a venture capitalist, this book is about how to think creatively, create value, and build a viable business. The book got started when a graduate student of Thiel's named Blake Masters took detailed notes on the class and published them online, which you can read here: CS 183: Startup. 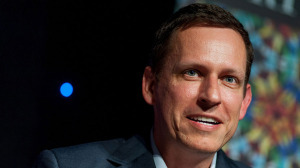 Peter Thiel co-founded Paypal in 1998, which was sold to eBay in 2002 for $1.5 billion. The group of co-founders that he founded the company with became known as the Paypal Mafia, who after the Paypal sale went on to create seven companies valued over $1 billion (including Tesla, LinkedIn, and Youtube). The first book published by someone with a list of achievements like this quickly becomes a big deal. Last month, when Zero to One was released, I started noticing a lot of my favorite podcasts, like Tim Ferriss and James Altucher, invite Thiel on as a guest. I had very high expectations for this book. Fortunately, it is extremely practical, smart, and engaging. It's one of the best books I've read this year. "Every moment in in business happens only once. The next Bill Gates will not build an operating system. The next Larry Page or Sergey Brin won’t make a search engine. And the next Mark Zuckerberg won’t create a social network. If you are copying these guys, you aren’t learning from them. Of course, it’s easier to copy a model than to make something new. Doing what we already know how to do takes the world from 1 to n, adding more of something familiar. But every time we create something new, we go from 0 to 1." I don't have much interest in reading about investment or capital management, but this book is about so much more. In this way, it's very similar to Creativity, Inc. which is one of the best books that I read this year. It's a grounded, practical guide to creating value and distinguishing yourself amidst a landscape of followers. In the first chapter, Peter Thiel introduces the concepts of intensive versus extensive progress. Intensive progress, or vertical progress, is when a company does something new, like build a word processor when the market is building typewriters. If you start with one typewriter and build 100, you've made extensive (or horizontal) progress. 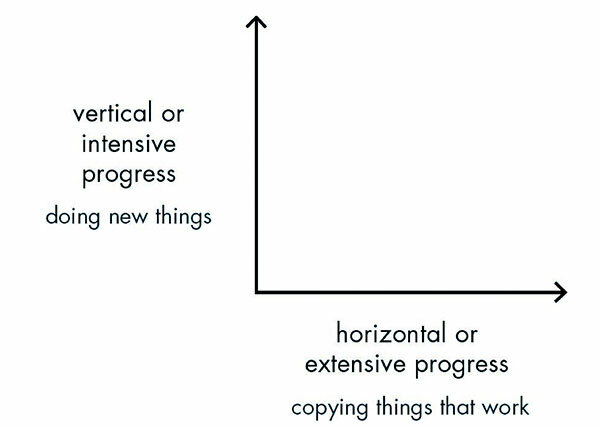 The best example for horizontal progress (in Thiel's words) is China, which has been straight-forwardly copying everything that has worked in the developed world. To the right is an image from the book which explains how this concept works. Zero to One is about escaping this trap and embracing the principle of innovation to give your business a chance to grow large enough to change the world. But creating value alone isn't enough – you also need to capture some of the value you create. It's simple but powerful ideas like this which fill this book. "Tolstoy opens Anna Karenina by observing : “All happy families are alike; each unhappy family is unhappy in its own way.” Business is the opposite. All happy companies are different: each one earns a monopoly by solving a unique problem. All failed companies are the same: they failed to escape competition." "For Hamlet, greatness means willingness to fight for reasons as thin as an eggshell: anyone would fight for things that matter; true heroes take their personal honor so seriously they will fight for things that don’t matter. This twisted logic is part of human nature, but it’s disastrous in business. If you can recognize competition as a destructive force instead of a sign of value, you’re already more sane than most." "Higher education is the place where people who had big plans in high school get stuck in fierce rivalries with equally smart peers over conventional careers like management consulting and investment banking. For the privilege of being turned into conformists, students (or their families) pay hundreds of thousands of dollars in skyrocketing tuition that continues to outpace inflation. Why are we doing this to ourselves?" "For a company to be valuable it must grow and endure, but many entrepreneurs focus only on short-term growth. They have an excuse: growth is easy to measure, but durability isn’t. Those who succumb to measurement mania obsess about weekly active user statistics, monthly revenue targets, and quarterly earnings reports. However, you can hit those numbers and still overlook deeper, harder-to-measure problems that threaten the durability of your business. For example, rapid short-term growth at both Zynga and Groupon distracted managers and investors from long-term challenges. Zynga scored early wins with games like Farmville and claimed to have a “psychometric engine” to rigorously gauge the appeal of new releases. But they ended up with the same problem as every Hollywood studio: how can you reliably produce a constant stream of popular entertainment for a fickle audience? (Nobody knows.) Groupon posted fast growth as hundreds of thousands of local businesses tried their product. But persuading those businesses to become repeat customers was harder than they thought. If you focus on near-term growth above all else, you miss the most important question you should be asking: will this business still be around a decade from now?" "In philosophy, politics, and business, too, arguing over process has become a way to endlessly defer making concrete plans for a better future." I loved every moment of this book and finished it in two sittings. It's not just that it's practical and insightful: it's makes its point with remarkable clarity. I would consider this a must-read for anyone working in the tech industry especially, but is a fantastic read for anyone who wants to develop a better understanding of what makes some companies explode while others get crushed by the competition.